The 'Sai-Taj' durbars seem to be a recent phenomenon. People who have belief in both the saints--Sai Baba and Tajuddin Baba, visit these durbars which now exist in various cities. These durbars are neither temples nor like samadhis or mazaars. But there are certain rituals that are observed here and the members of different communities with beliefs in the saint, visit these places. The social gatherings at these durbars may not be too large but there is a camaraderie among visitors of every durbar, which is quite similar to the bonding in a cult. I have met a number of people who are associated to different durbars. A friend is a staunch devotee of a living saint, who dabbles in tantrik practices. The devotees of Sai Baba of Shirdi comprise members of almost all the communities though he is now more considered a Hindu saint and Sai temples are common across the country. 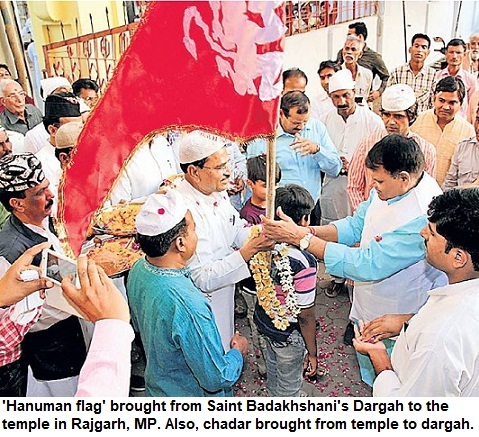 Tajuddin Baba, a Sufi saint, has a huge following in Maharashtra and neighbouring states, particularly Chhattisgarh. Though the durbar can comprise of any two or three saints' devotees, Sai Baba and Tajuddin Baba share much more in common as they hail from same region and there are tens of thousands who throng to both shrines, in Shirdi and Nagpur. Thus the existence of such durbars makes more sense. Of course, there is a commercial angle also. But that's the case with most shrines. The growing religiosity, ritualism and even beliefs in cults may worry social scientists and rationalists, one can't dismiss them as they do provide succour to the genuine devotees who have faith in babas and feel that they get mental peace at such places. At the durbars, the anniversaries are celebrated with great fanfare and on certain week days also there is a big crowd. Otherwise the atmosphere is same--incense sticks around lifesize photographs and portraits of the saint, whom many believers consider divine and even at par with God. Many Hindus and Muslims disapprove of such practices and are alarmed at the growing number of cults. However, this is a unique aspect of the Indian culture and shows the general devotion among masses many of whom remain attached to a particular religion but are at the same time devoted to saint belonging to another religion with an equal fervour.